Due to heavy rains the week of our planned Day of Service, CALCP held two days of community service this year. 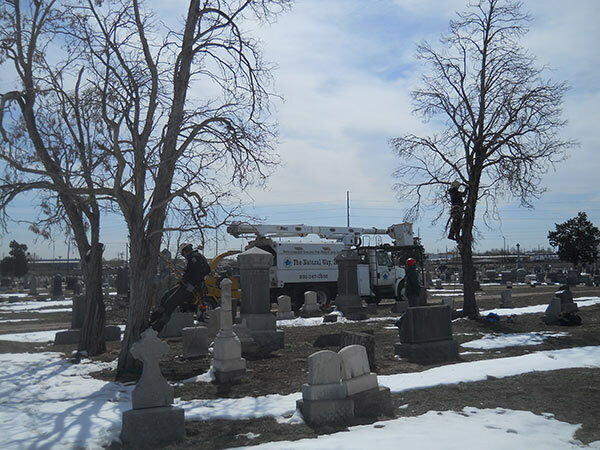 6 tree companies came out to Riverside Cemetery and removed about 60 dead trees on Friday April 19. 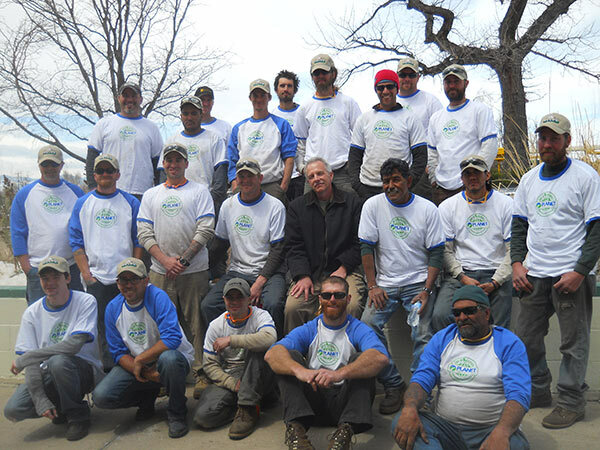 The next week, about 25 lawn and tree care professionals turned out to do additional work including tilling the soil, adding Revive and fertilizer, and planting 3 acres in native grass seed. The three raised Plant Select Demonstration beds were cleaned and prepared for summer growth. A large garden bed was prepared and planted with Plant Select plants near the main entrance area as well as Heritage iris plants moved to a new bed at the rear entrance of the cemetery. Mulch was spread around existing shrubs that were planted the year previously. 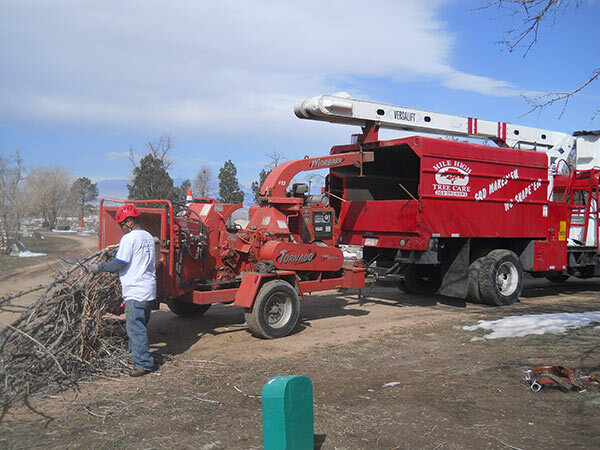 The value of the equipment donation, seed/fertilizer and Revive and work completed was at least $15,000.00. Fairmount Heritage Foundation again provided adequate snacks and lunch for everyone. Companies who sent crews and equipment for the work days included: The Davey Tree Expert Company, Swingle Tree, Lawn & Landscape Company, Mountain High Tree, Lawn & Landscape Company, Mile High Tree Care Company, The Natural Way, Inc., Ironwood Earthcare Inc., Lutey’s Landscaping Inc, Centennial Property Maintenance, Helena Chemical Company, John Deere Landscapes, Green Mountain Lawn & Tree Care, Terra Care Associates, and Thunderbird Design. Donors who provided supplies and equipment included: Alpha One Fertilizers, Revive, Helena Chemical Company, L.L. 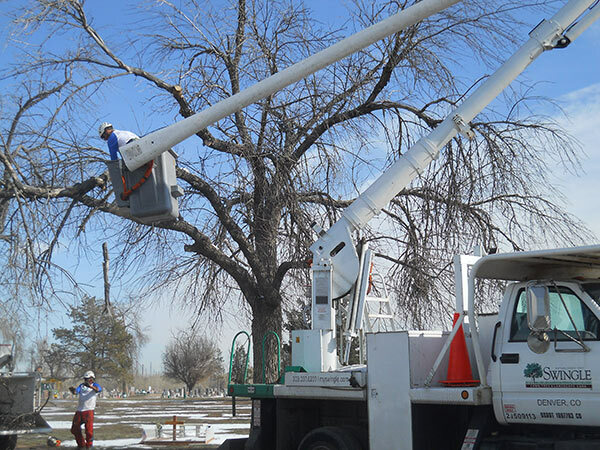 Johnson Distributing Co, Pawnee Buttes Seed Company, Professional Tree & Turf Equipment, and Welby Gardens. Several master gardeners also were on hand to assist.